Filter radiometric detectors conforming to ACGIH/ICNIRP and CIE UV Erythemal UV and Blue Light irradiance and radiance spectral effectiveness functions. Two sensor design for best match to the actinic photobiological spectral function and best separation between UV-A and UV-C/B ranges with superior out-of-band signal blocking. 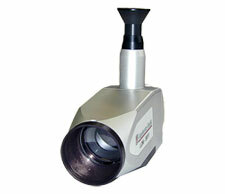 XD-9506-4 Detector for use with X11 optometer to measure the ICNIRP/ACGIH effective irradiance. Two sensor design for reduced cross talk between the UV-A and UV-CB. Calibration in W/m2 and W/cm2. 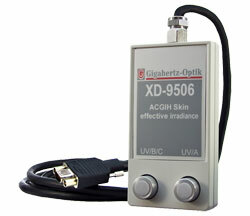 XD-9509-4 Detector for use with X11 optometer to measure the CIE UV Erythemal effective irradiance. Two sensor design for reduced cross talk between the UV-A and UV-CB. Calibration in W/m2 and W/cm2. LDM-9811 Radiance Detector with viewing optic and 100, 11 and 1.7mrad field of view. PD-16 type detectors for Blue Light, Retina Thermal (500-1200nm) and Retina Thermal A (800-1200nm) hazard. Calibration in W/m2sr. The detectors are supplied with a 2m long coaxial cable with selectable -1, -2 or -4 type connector for use with Gigahertz-Optik's range of optometers. Internationally traceable calibration & certification of UV irradiance in effective Wm� and W/cm� within the specified spectral sensitivity range is provided. X1-3 Light Hazard Radiometer for risk assessment per directive 2006/25/EC and DIN EN 14255-1. Also supports lamp and lamp system product classification for photobiological safety in accordance with EN 62471.